No country is as misunderstood as North Korea, and no modern tyrant has remained more mysterious than the Dear Leader, Kim Jong Il. Now, celebrity ghostwriter Michael Malice pulls back the curtain to expose the life story of the “Incarnation of Love and Morality.” Taken directly from books spirited out of Pyongyang, DEAR READER is a carefully reconstructed first-person account of the man behind the mythology. From his miraculous rainbow-filled birth during the fiery conflict of World War II, Kim Jong Il watched as his beloved Korea finally earned its freedom from the cursed Japanese. Mere years later, the wicked US imperialists took their chance at conquering the liberated nation—with devastating results. But that’s only the beginning of the Dear Leader’s story. 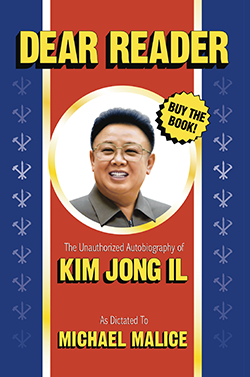 With nothing left uncovered, drawing straight from dozens of books, hundreds of articles and thousands of years of Korean history, DEAR READER is both the definitive account of Kim Jong Il’s life and the complete stranger-than-fiction history of the world’s most unique country. © 2019 Dear Reader: The Unauthorized Autobiography of Kim Jong Il. All rights reserved.